Last Sunday 15 members and guests of the Flint River Bass Club fished our April tournament at Lake Oconee. We choose Lake Oconee April Tournament because fishing is usually good there. In 8.5 hours of casting we brought in 38 bass over the 14 inch size limit. There were five five-bass limits and two people didn’t bring in a keeper. Travis Weatherly won it all with five weighing 13.01 pounds and his 3.44 pound largemouth was big bass. Chuck Croft was second with five at 10.12 pounds, I came in third with five weighing 9.32 pounds and Niles Murray placed fourth with five at 8.88 pounds. When we took off I noticed everyone but me went up the Oconee River from Long Shoals ramp. The water was more stained that way than it was in Double Branches where I headed. And it seems the bite was different. I tried spinnerbaits and crankbaits but never got a bite on them. But at weigh-in the other three finishing in the top four all said they caught their fish on spinnerbaits and crankbaits. After about 30 minutes I stopped fishing those faster moving baits and switched to a Texas rigged lizard, and almost immediately caught a good keeper. So I kept fishing it and had three at 9:00 in the first cove we fished. The next cove we went to I quickly filled my limit by 10:00 on the lizard but then it got tough. I fished hard but at 2:30 had not caught another keeper. My partner Wesley DeLay and I both caught a lot of 13 inch bass, too short to weigh in. Finally at 2:30 I landed a bass big enough to cull my smallest fish. But that was it, I landed six keepers all day. Most tournament fishermen want to be in control of the boat and fish from the front. At times it makes big difference, and it seemed to Sunday. Travis fished by himself so it did not make a difference, but JJ Polak fished from the back of Chuck’s boat. Chuck had five, JJ had one keeper. I had five and Wesley, fishing behind me, had one. And Niles had five while Jack Ridgeway, fishing from the back of his boat, had one. I’m not sure why it made a difference. Wesley and I both were fishing the same bait. I steadily moved down the bank and the fish I caught were not on any kind of visible cover. So each of us were blind casting to the same water. I probably made a cast every 20 feet or so, leaving lots of un-fished water between casts. A bass will move a couple of feet to hit a bait like a lizard but I don’t think they will move ten feet one way or the other to hit one. Bass are ambush fish, relying on a short burst of speed to catch and eat their quarry. For them to move ten feet to hit something moving along the bottom would be unusual, I think. But who knows why bass act like they do. I have certainly had plenty of days when my partner beat me from the back of the boat and I’m sure it will happen a lot more times. This entry was posted in Bass Fishing, Tournament Fishing on April 21, 2016 by ronniegarrison. Spring Chinook fishing opens April 23, and anglers often wonder how many salmon there will be and how long the season will last. It’s a challenging question to answer because unlike most Idaho fisheries, salmon seasons are dependent on how many fish return from the ocean each year. That number varies wildly from year to year, and Fish and Game must balance the wants of anglers with ensuring enough Chinook are available to keep hatcheries operating, protect wild fish listed under the Endangered Species Act, and abide by agreements with other states and tribes to share the harvest of hatchery Chinook. It’s a tricky mix of management that can complicate the answer for folks who just want to know how long salmon season will last. Idaho has had an unprecedented run of chinook fishing seasons. This year will be the 16th straight year Fish and Game has provided a season, which is the longest unbroken streak dating back to 1954. Before then, salmon fishing was largely unregulated. Chinook fishing kicks off with the spring run, and there’s fishing in the Snake River, Clearwater River and Salmon River and several tributaries. 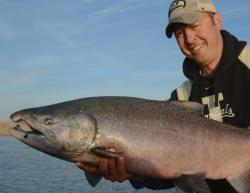 Over the last 20 years, spring chinook runs have averaged 54,160 fish annually. The previous 20 years (1976-95), the spring runs averaged 17,646, and fishing seasons were sporadic and often short-lived. Last year, about 95,300 hatchery chinook crossed Lower Granite Dam about 25 miles downstream from Lewiston. Non-tribal anglers in Idaho harvested 22,075 of them during the spring and summer seasons. The forecast for this year is 66,100 hatchery fish to cross Lower Granite, which means about 24,000 will be available for sport anglers to harvest. But biologists won’t know how exactly how many can be harvested until fish start reaching Idaho, and the run has just started. Each winter, Fish and Game biologists predict the upcoming run based on the return of jacks from the previous year. Young salmon, known as smolts, migrate to the ocean each spring at about two years old. Those smolts grow in the ocean and return over the next three years. Some chinook return to rivers after spending only a year in the ocean. They’re known as “jacks” because they’re almost all males, and younger than most other salmon returning. Most chinook that return to Idaho spend two years in the ocean, so the number of jacks is an indicator of how many “two-ocean” chinook will return the following year. Finally, a small percentage returns after three years in the ocean, and on rare occasions, four years. Biologists use last year’s jack salmon return to forecast the size of this year’s run, and that information allows Fish and Game to set a salmon season before the first Chinook arrives in Idaho. Biologists also monitor the run as fish move past fish counters at the dams on the Columbia and Snake rivers, and they use fish embedded with tiny electronic tags known as PIT tags to determine where the fish are headed. “We’re able to make the forecast of fish returning to each hatchery or river section based on PIT-tagged fish,” Fish and Game’s anadromous fish manager Pete Hassemer said. Chinook start crossing Lower Granite Dam in April, but the peak usually hits in May. That’s when Fish and Game closely watches the number of fish arriving in Idaho, where they’re heading, and how many fish anglers are catching. Since the seasons and limits were based on a forecast, it’s important to track the actual return and harvest by anglers. Small daily bag limits help keep the harvest within quotas and spread the fishery over a larger area and ensure enough fish are available for anglers farther upstream. It’s more than a curious question – it’s how Fish and Game determines how many fish are caught each day and how long the season lasts. Fish and Game personnel count anglers and interview them throughout the fishery to see how many fish they’re catching. “Our creel program has been designed to ensure we conduct enough angler counts and interview enough anglers to have a good understanding of how many fish are caught each day,” Hassemer said. Fish and Game communicates weekly with the other states, tribes and federal agencies during the season to share information. By Tuesday of each week, biologists have a good idea if there are enough fish remaining to sustain fishing through the following weekend. Fish and Game posts updated information on its web page so anglers can see how many have been caught. They can find that information at http://fishandgame.idaho.gov/ by looking the under “Chinook Salmon” under the Fishing tab. (Direct link: http://fishandgame.idaho.gov/public/fish/?getPage=114). The goal is to provide good information for anglers so they have a better understanding where fish are being caught, how good the fishing is, and when closures might occur. “We generally avoid closing on Friday because we want to give anglers as much opportunity as we can,” he said. But anglers should remember that their portion of the Chinook return can be caught very quickly, especially when fishing is good and the harvest share is modest. That’s often the case during popular river stretches. On the Lower Clearwater River, the season typically lasts about 15 days after the first fish arrive. On the South Fork of the Salmon River, the harvest share can be caught within a few days of the peak run arriving. “Once fish start arriving in the smaller streams and the water is low and clear, anglers are quite successful,” Hassemer said. Fishing seasons on the Lower Salmon and Little Salmon rivers tend to last longer and are a little more predictable. Snowpack and spring run-off influence the timing of the runs. Spring chinook tend to follow peak spring run-off, so when the Salmon River starts receding, usually in late May, early June, it’s time to go salmon fishing. Biologists also carefully watch tag data to ensure fish bound for hatcheries in the Upper Salmon aren’t overharvested lower in the river system. Long-term data shows about 90 percent of the chinook harvested in the Salmon River around Riggins and White Bird are bound for the Rapid River Hatchery. Considering forecasts rarely predict the exact number of fish, biologists keep a watchful eye on the actual return. Sometimes late-returning fish will allow them to keep the season open a little longer. Other times, fewer fish than expected return, and the season is cut short. But Fish and Game’s goal is to ensure anglers get an equitable share of the available harvest. “We really try to make sure we don’t close too early and have anglers off the water when they could be fishing for these prized salmon,” Hassemer said. This entry was posted in Conservation, Trout and Salmon on April 20, 2016 by ronniegarrison. Politicians don’t tell the truth. Its just the way of politics to tell people what you think they want to hear. Exaggerations, misleading statements and similar things are the rule. But sometimes politicians tell such blatant lies it is hard to understand how anyone can listen to them. Hillary Clinton is constantly telling lies about gun laws, the gun business and why you and I own guns, all the time trying to make it harder for us to own a gun while she is hiding behind armed guards. The current lie of the day is that gun manufacturers and sellers are not liable for their product the same way other business are for their product. The stated goal of the anti-gun groups is to put gun manufactures and retailers out of business by suing them when a gun is used in a crime. That is like Rosie O’Donnell suing spoon manufacturers because she is fat. Or it is like suing a gas station and Shell oil because someone buys a gallon of gas and uses it to burn down a house. The law suits got so ridiculous a few years ago that our elected representatives passed a federal law that gun manufacturers and retailers were not liable if their product was misused. That is the way it is with every product made but liberal judges were singling out the gun industry. And they still are doing that, trying to put them out of business. A state judge in New Jersey ruled last week a suit against Remington could proceed, even though there is federal law against such lawsuits. That lawsuit says Remington should not have made a gun for civilian sales that is a military weapon. Anyone knowing anything about guns knows the multiple fallacies of that claim. Gun banners can’t get laws passed that they want because there are too many gun owners and other rational people opposing them. So they try to go through the courts to accomplish their goals. They can’t stand the thought of a law abiding citizen having something they personally don’t approve of so they try to ban it for everyone. This entry was posted in Guns and Gun Control on April 19, 2016 by ronniegarrison. What Is Walleye Egg Collection? The Ohio Division of Wildlife has been asked to collect 200 quarts of walleye eggs from Mosquito Reservoir for hatchery production this spring. What does this mean? How do they do it? Why do they do this? What is the end result? 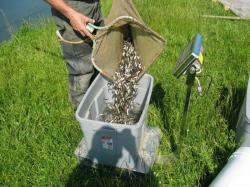 • ODNR Crews set 16 trap nets on Mosquito Reservoir to collect fish. • Nets are set in shallow water- 14 feet deep or less. • IF YOU SEE A NET, PLEASE STAY AWAY FROM IT!!!!! • If it swims, we catch it! Walleye, crappie, perch, sunfish, and catfish are commonly caught, but we do catch pike, bass, and an occasional mudpuppy. • Fish are netted from the end of the net and processed on the boat. • Female walleyes ready to spawn are the target. 15 – 22″ is normal- 25″ and up have been seen! • Female walleye eggs are mixed with either walleye sperm to make walleye OR sauger sperm to make saugeyes. 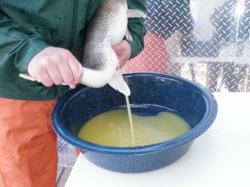 • Each quart of walleye eggs taken can yield 130,000 fish. • A large female walleye can have 2 quarts in her! • Fertilized walleye eggs are taken back to Senecaville State Fish Hatchery (Guernsey Co.). • Eggs can die off due to low water flow, fungus, poor fertilization, or rapid temperature changes. • Fish are then hatched off in jars in about 3 weeks. • Fish can either be stocked as fry (see above) or fingerling (see right), depending on the lake. 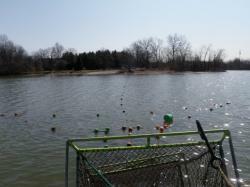 • Fry are 1/4″ long, are stocked in late April, and typically stocked at a rate of 1000 / acre of water. • Fingerling are 1-2 inches long, are stocked in late May, and are typically stocked at a rate of 100 / acre of water. • Fish stocked in the spring will grow to 8 inches by September. • More importantly, fish stocked in 2012 will be about 15 inches within 2 years. They grow REALLY fast with how much gizzard shad there is for them to eat! • We know that some fish will die throughout this process. 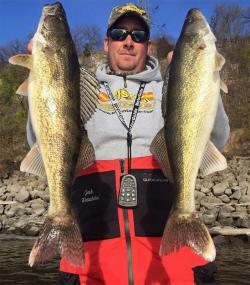 Taking the eggs from the female walleye is rough on them, especially when the water is warmer. • Also, stocking such small fish will lead to some of them dying. If we get 1/10 of 1% (0.001) of the fish we stock to live to reach 15″, we are doing great! But the bottom line is that without these efforts, walleye fishing on most of our inland lakes would not exist. Natural reproduction is not consistent enough to keep these high quality walleye fisheries going each and every year. Habitat is poor, and the conditions for a good natural spawn are rarely achieved- see Lake Erie! The Ohio Division of Wildlife conserves and improves fish and wildlife resources and their habitats for sustainable use and appreciation by all. This entry was posted in Walleye and Sauger on April 18, 2016 by ronniegarrison. 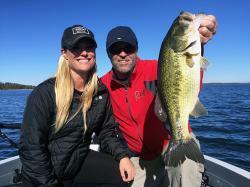 Pro bass angler Mandy Ulrich and TV host Steve Pennaz hoist the spoils of fishing jerkbaits in cold water. The air temperature was 22 degrees when we finally launched the boat, and water temp on my graph varied from 36 to 42 degrees depending on our location on the river. The Commando format is simple: Each angler picks a pattern before getting on the water, and then we see who catches the most fish. For this particular show Chad picked a great year ’round smallmouth pattern: 3.5-inch Berkley Power Tubes while I picked jerkbaits, specifically the new Cutter 110+. For the next three hours we struggled to put a fish in the boat. I had one fish hooked on the tube, but lost it, and after we switched to jerkbaits it was clear we were doing something wrong. Berkley’s new Cutter 90+ in Chameleon Vapor pattern.The 3.5-in., 3/8 oz. bait is the smallest in the three-model jerkbait family. A series of tweaks fixed that. Our first move was to downsize from the Cutter 110+ to the 90+. Secondly, we dropped anchor so we could slow our retrieves. The final tweak was the final puzzle piece: we cast downstream or quartering and slowed our retrieves to a crawl. And we started to catch smallmouths…a lot of smallmouths. But the funny thing was, I was catching small fish and Chad was catching big fish. What Chad had figured out was key: cast directly downstream and allow the current to work the bait. He’d jerk it two or three times to move the bait forward and then he’d let the current wash it back on a semi-slack line. As a result, he was getting the big fish – 3s, 4s and 5s – while I was getting the 15 and 16 inchers. The big fish simply weren’t going to chase a faster retrieve. At one point, Chad put his rod down to net a fish for me, leaving his bait to essentially wash in the current a bit. When he went back to pick up the rod, there was a fish on it! This should have been a lesson for me to slow down, but at that point it was too late in the day, and we wrapped the show. I caught more fish, but Chad whipped me in total weight. Another lesson learned: There are times when you can fish a bait wrong by fishing it too fast – especially jerkbaits. Years ago Steve Pennaz fished a “jerkbaits only” tournament on Lake of the Ozarks, an experience that taught him numerous lessons. These days, he keeps a jerkbait rod rigged and ready at all times. If you want to become a better jerkbait angler, here are some things that will improve your success. Lesson #1: Down, down, down! Some anglers have the tendency to fish jerkbaits by moving the rod horizontally, even vertically. Actually, its better to fish jerkbaits by moving the rod tip in downward sweeps from roughly the 3:00 o’clock to 5:00 o’clock position. Quick rips at the beginning of your retrieve will help your bait reach your target depth zone sooner, and subsequent strokes and pauses will keep the neutrally-buoyant bait more or less on a horizontal retrieve toward the boat. Introduce slack line between the lure and the rod tip before you start the actual jerk-stroke down and immediately after. The introduction of slack line produces more erratic lure action and allows the bait to glide naturally after the stroke. You want to hear “tsst, tsst, tsst” during each cast. I quickly learned that the right cadence and stroke combination is key to jerkbait fishing. During our filming, water was cold and bass did not want the baits fished fast; the pause was key, those moments in the retrieve when the bait would just sit in the water column, neutrally buoyant. Instead of a pop, pop, pop, and pause – or even two pops and a pause – it was a single stroke followed by a pause that got bites. As a general rule of thumb, the colder the water, the slower you should fish a jerkbait. There may be times when you need to pause 10, 20, 30, or even 50 seconds between jerk-strokes. It’s painful to fish that way—and I hate it—but sometimes that’s the only way you’re going to get bit in cold water. Other times, fish may want the bait fished more aggressively. The best way to fish a jerkbait can also depend on target species. In this particular tournament we were targeting largemouths, and I mention that because smallmouths and largemouths seem to react differently to how jerkbaits are fished. In some cases it can really be apples and oranges. My experience is smallmouths typically want the bait fished with more aggressive strokes, while largies prefer jerkbaits fished slow. Still, on most days, you’ll need to let the fish tell you what you what they want. I’m 6′ 2″ and I fish out of a Ranger 620FS, so I’m a little higher off the water when I’m fishing off the deck. So, depending on your height and your boat, the key is to look for a rod that is long enough that you can fish the bait with a downstroke without the rod tip getting wet. My go-to rod (an Abu Villain) measures 7 feet and features a soft tip. I like a long rod; I can pick up line faster, and it gives me a little more control of the fish during the fight. For larger jerkbaits, I prefer a medium-power baitcasting rod, which is 90% of the time. But for finesse situations in clear, heavily-pressured waters, I will step down in bait size and use a spinning rod. But no matter which you choose, the rod should have enough backbone to move the jerkbait. I like a 7′ medium-action rod with a softer tip, which allows slower bait movement at the start of each rip (doesn’t seem to spook as many fish). A softer tip is more forgiving with hooked fish; you’ll land more fish. I’m usually throwing jerkbaits on 8-, 10- or 12-lb. Berkley Trilene 100% Fluorocarbon. First, it’s a little stiffer than mono to prevent the bait from hooking itself on your line. Secondly, because fluorocarbon sinks, that little extra weight can help keep baits down. Lastly, the near-invisibility of fluorocarbon puts the odds in your favor on clear waters. Fish that move 10, 20, 30 feet or more to hit a bait can be line shy. The exception to the rule comes when fishing long pauses. There may be times when heavier fluoro can cause certain baits to nose-dip. In those cases, I may switch to neutrally-buoyant monofilament to keep baits horizontal. Berkley’s new Cutter 110+ in Black Silver pattern. The 4 3/8-in., 9/16 oz. bait is the largest, beefiest bait in the new jerkbait family. Which jerkbait hook you catch the fish on can tell you a lot. If you’re catching bass barely hooked via the rear jerkbait hook, chances are fish aren’t in love with what you’re doing. So, you may want to look at your presentation. Are you fishing with the right color? Am I fishing it too fast? Not fast enough? The best bites are those when the front or front and rear hooks end up in the bass’ mouth. I’ll start by trying different colors if I get several fish on the back hook. In clear water, I like more natural patterns, those translucent finish options in silver or natural forage patterns. But there are times when it seems smallmouths react better to bright baits with chartreuse and oranges. So, start with more natural patterns and see what the fish prefer. There are a lot of great jerkbaits on the market, but I’m most excited about Berkley’s new Cutter Series, designed by David Fritts, and fished by pros like Justin Lucas, Josh Bertrand, Gary Klein and Scott Suggs. Unlike most jerkbaits, the three baits in the Cutter Series feature a coffin-style bill—a complete departure from traditional jerkbait design—for an action all their own. It’s almost like an underwater walk-the-dog with a slight side-to-side roll. And bass crush ’em. The Cutter 110+ is a beefy, standard-size jerkbait; the Skinny Cutter 110+ has a similar length but thinner profile; and the Cutter 90+ has only two treble hooks — the perfect jerkbait for finesse situations. Each comes in 12 finishes and features Berkley’s new Fusion 19 hooks, which are sticky sharp. My go-to bait is the 110+ but there are times when downsizing to the 90+ is simply the best way to get bit. Berkley’s new Skinny Cutter 110+ in Gilly pattern. The 4 3/8-in., 7/16 oz. bait is a perfect “in between” size jerkbait for both largemouths and smallies. Really, the best way to learn how to fish a jerkbait is to leave the dock with a small sample of jerkbaits – and commit to yourself to fish only those baits for the day. It’s even better to have two anglers in the boat: one fishing fast, the other fishing slow; one fishing natural colors, the other bright colors; one fishing a larger bait, one a smaller bait; and so forth. What will happen is you’ll start figuring out little patterns in the patterns. Finally, although we’re focused on early-season cold water right now, keep in mind that jerkbaits are incredibly versatile. Sure, they’re a great spring, fall and winter bait, but can perform in warm-water situations, too! This entry was posted in Bass Fishing, How To Fish on April 13, 2016 by ronniegarrison. The thunderstorms week before last did more than bring back memories of past storms and delay my trip to the Alabama River. Some areas of central Alabama had over five inches of rain that night. I saw the results of all that rain when I got to the Alabama River this week for the article. It was four feet high, muddy and the current was ripping. I went out with one of the best river fishermen in the area, Erick Sommers. Erick wins a lot of tournaments there and knows it well. He warned me that fishing would be terrible with the conditions but due to my deadline I had to get the information for the article. He showed me ten places on the river where he and his partners catch big spotted and largemouth bass. We fished hard but it was just about impossible to even fish most of the places due to the current. Erick said some current makes the fish bite better. When two or three turbines are running at dams upstream it is just about right. Four makes it difficult. There were five running the day we went! On one spot we marked for the article he showed me a picture of his son, Chase, holding up two of the three five-pound spots he had caught in a youth tournament. One of them came off the place we marked. Chase had three spots weighing over five pounds each that day and won his tournament with three fish weighing over 16 pounds. 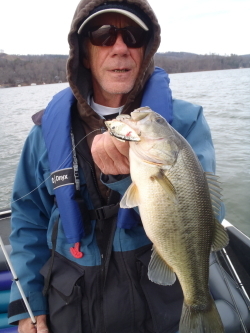 Erick also showed me pictures of some of the five and six pound largemouth he had landed in tournaments there. The Alabama River produces a lot of big bass on normal days. Erick’s best catch of spots ever was five weighing 29.83 pounds, an incredible catch anywhere but even more amazing that it was all spots. He says it takes five bass weighing 25 pounds to win most tournaments there. Locals just call it the river but the official name is either Jones Bluff or Woodruff reservoir, depending on what government agency you check. No matter what the name, it runs 80 miles from the junction of the Coosa and Tallapoosa Rivers in Wetumpka down to the dam southwest of Montgomery. If you plan a trip it is close to three hours to get there from Griffin. There are a lot of ramps and campgrounds open to the public. Go over there and catch your best spot ever! The weather this spring has been its usual normal unusual. I always get excited when it warms more than expected in early March, but as often happens it turns colder in April than expected. And the bass often respond by doing unusual things. One week it seems all the bass in the lake are shallow and getting ready to bed. They are fairly easy to catch no matter what you do. Then a cold front comes through and it gets tough. All you can do is wonder where the bass went. Fish do not like bright sun most of the time. Even the bream in my pond won’t feed much when it is bright and sunny. On a cloudy day I can throw out floating fish food and they churn the water like a school of piranha. On a bright sunny day very few will hit the food as it floats along. The usual response when bass fishing is to go to smaller baits and fish places where there is less light. You can fish deeper water or try to get your bait way back under a dock where the sun doesn’t shine. Sometimes those tactics work, other times you just get in a lot of casting practice. At least that is the way it seems to work for me. There is a big BASS Elite tournament this weekend on the coast of South Carolina. It will be interesting to see how the top pros adjust to the high pressure cold front. They are fishing one of the rivers and swamps on the coast with miles of shallow water and cypress trees. I suspect those trees will play a big part. Another group of fishermen are at Hartwell for the Ray Scott Championship. It is a very different fishery from the coast. Jordan McDonald qualified to fish it and I hope he does well, adjusting to the conditions and catching fish. This entry was posted in Bass Fishing, Where To Fish on April 12, 2016 by ronniegarrison. How To Pitch Plastics … Like A Plumber? 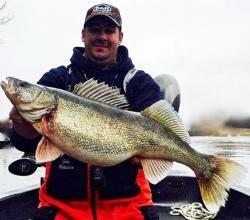 Although obsessed with big walleyes, Minnesota guide Josh Wetzstein is pretty humble about statistics. “I haven’t measured a fish in years. Walleyes or muskies. Hold ’em up, snap a photo and put ’em back in the water,” says Wetzstein. Like the sag-bellied monster (in the cell phone image below), caught this past weekend on Pool 4 of the Mississippi River, that Wetzstein “guesstimates” the fish to be in the neighborhood of 12 pounds. “They had just opened the roller (gates) and it started snowing when I caught that fish. The water came up quick and fish started scrambling. Came together just right and she bit,” laughs Wetzstein. His program? Pitching shallow water with plastics. Some days yield big fish, while others don’t. Not a big deal to Wetzstein, whose other passion is muskie fishing, although he catches his share of respectable mid-sized walleyes, too. “Besides the big fish this weekend, we caught probably thirty fish between 18 and 26 inches. And lots of milking males,” says Wetzstein. “I usually pitch upstream and let the flow sweep my bait down past the boat,” Wetzstein says. For Wetzstein, a ‘better job’ equates to a dozen rods or more – 6’8″ to 7′ St. Croix Legend Elite and G Loomis NRX with extra fast actions – all rigged with different line types in different diameters and test. He also totes vast variations in jig head styles and weights, and myriad profile and color plastics. Plus, a few more sticks are rigged with various size blade baits and hair jigs. During early-season, Wetzstein typically pitches jigs tied direct to 10 – 15 lb. PowerPro braid so he can free baits from snags without wasting time re-tying. But when it’s really cold and the water clears he’ll turn to 10 lb. NanoFil and a 15-lb. fluoro leader. And for super-finesse situations he opts for 6 or 8 lb. Berkley Sensation thin-diameter monofilament in high-visibility orange. Given the conditions on Pool 4 right now, Wetzstein says 3/16 oz. jig heads are about right for pitching, but there’s always a fine line between getting bit and getting snagged. And when to comes to his favorite Moxis, he sticks to fluorescents and the occasional dark pattern for dirty water, and natural colors like ‘oystershell’ for clear water. This entry was posted in How To, Walleye and Sauger on April 7, 2016 by ronniegarrison. When the crashing thunder woke me Thursday night I smiled – thinking how glad I was to be at home and not on the lake. Lightning thunder and fishing do not go together for me! While I was growing up lightning terrified me no matter where I was. That came from spending the night on our screened in porch when I was about eight years old during a huge thunderstorm. After that night lightning and thunder scared me. As I got older I learned that I could be safe, even outside, but I still will not be out in open water when a thunderstorm is near. I was supposed to go to the Alabama River near Montgomery for an Alabama Outdoor News article early Thursday morning. On Wednesday night I talked with the fisherman taking me and we agreed to postpone it till this week due to the weather. Both of us agreed we don’t mind rain but do not want to be on the water during a light show! That was the right decision. There was a BASS Open tournament on Smith Lake north of Birmingham starting Thursday. BASS sent out a text at 4:00 AM Thursday morning to the 350 fishermen entered in it that the first tournament day was canceled and it would be a two day rather than a three day tournament. They don’t do that except in dangerous circumstances. Over the 42 years I have had a bass boat I have spent some scary hours in one on lakes during a thunderstorm. One of the first was in the early 1970s in late June on Bartletts Ferry just north of Columbus. Bob Pierce and I had gone down and camped before a tournament to practice. Back then we always put in at the dam. Bob and I decided to run way up the Chattahoochee River one day. It is still dangerous but now there are channel markers to keep you off the mud flats. There were none back then. We slowly worked our way up the river in my 1974 Arrowglass bass boat with a 70 HP motor, finding our way around the dangerous shallows. About 3:00 PM, without warning, lightning started popping all around us. We had not heard anything up until that time so did not have time to try to get back down the river. It was raining too hard to see even if the lightning had not bothered us. I eased into a small creek where I felt safe with big overhanging trees on the bank, thinking if lightning hit one of the trees we would be ok in the boat. I had to keep using the trolling motor to hold us in the creek. The wind kept trying to blow us back out onto the river and open water. After about an hour of this I realized the boat was no longer moving. It was so full of water it was sitting on the bottom, with the motor stuck in the mud. I turned on the bilge pump and it ran constantly for the next three hours. As it started getting dark at about 8:00 the storm broke and we managed to get back to the campground. That was a miserable afternoon of sitting and not fishing. A few years later on a hot August afternoon I went to Jackson to practice for a night tournament the following weekend. I had been fishing up Tussahaw Creek and catching a few fish but as it got dark I rode to the dam, in the same Arrowglass boat, and started fishing near it. Again, suddenly and without any warning, the wind started howling over the dam and lightning started cracking around me. It was one of those storms so close you hear a crack, boom and thunder so close to gather it is almost one sound. Back then there was no drum line keeping boats away from the dam. I pulled my boat right in the corner of it where it hit he rocks and put my trolling motor down between two rocks to hold me in place. The dam rose about 20 feet over me and had a metal railing that I thought would work as a lightning rod. When I looked up the rain blew over the top of the dam sideways the wind was so strong. I sat down in the drivers seat and put my head on my arms on the steering wheel. I could still see the flashes of lightning. It was so bad my dog Merlin crawled under the console to hide. After sitting like that for two hours the storm passed and I ran to Kersey’s, put the boat on the trailer and came home! In a Top Six tournament at Lanier in the early 1990s I was in the first group of boats to go out. There were 91 boats in my flight and all were sitting in a group out from the ramp at Laurel Park waiting on the signal to start taking off. We heard some thunder off in the distance then suddenly it was right on top of us. I told my partner I was not going to sit in open water and we idled over and got under a dock. The other 90 boats sat there and ignored the lightning. I was boat number 89 of the 91 and when the others were let go the storm had moved on. I waited a few minutes then took off. Fortunately that was the last storm of the day! We have lots of thunderstorms this time of year. Be safe, stay out of open water when fishing if one is near! This entry was posted in weather on April 6, 2016 by ronniegarrison.